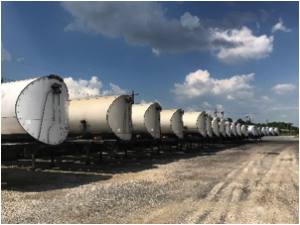 Liquid Bulk – Ee-Jay Motor Transports, Inc.
We provide on track storage for over 235 jumbo railcars making us one of the largest and most experienced liquid bulk handlers in the Central Midwest area. The majority of this track space is owned and maintained by Ee-Jay. 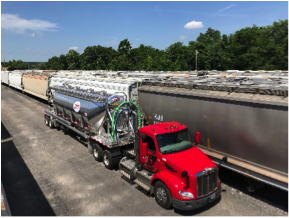 Ee-Jay's substantial fleet of large gallon carbon steel liquid bulk trailers are dedicated to specific commodity service. Tractors are equipped with PTO driven pumps and select trailers are equipped with industrial pumps to facilitate loading and unloading. Trailers are equipped with insulation and steam coils as needed for high temperature commodities. 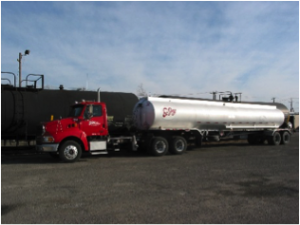 Ee-Jay is certified and capable of hauling bulk and packaged products all across the United States and Canada with our fleet of trucks. With newer equipment and an excellent CSA score we take safety and customer satisfaction very seriously. 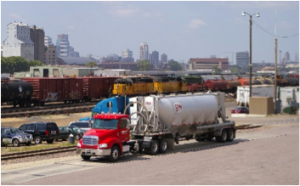 On premise in ground platform scales equipped with an electronic digital printer ensures accurate loading and inventory reporting at both our St. Louis and Minnesota locations.